FeedBurner Signs Off Twitter. Is FeedBurner Going Away? FeedBurner Signs Off Twitter. Now What? Is FeedBurner Going Away? Do Not Wait to Find Out! Most bloggers have been using Feedburner to manage their RSS feeds since before they got bought out by Google. What does FeedBurner signing off of Twitter mean? Not a peep about their plans so far – but FeedBurner has never been the same since Google bought them out. I knew about that tweet because I happened to be Skyping to Phil Hollows, creator of FeedBlitz about our plans to migrate all FeedBurner accounts. Phil just published his thoughts on FeedBurner Officially Not Listening Any More. NOW we better wake up and get it done because better safe than sorry. If Google kills FeedBurner all your feeds will quit working, your subscribers will be lost, and you’ll be starting over. and migrate to FeedBlitz now? Many of us have been wanting to migrate to FeedBlitz anyway, but it is so powerful and does so much that we haven’t made that happen yet. What we need is bloggers helping bloggers to make the transition. As soon as any of us has experience and skills, moving will be easier for all of us. 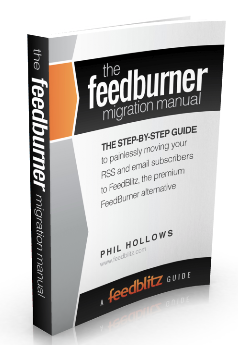 Fortunately, Phil @FeedBlitz now has a Free FeedBurner Migration Manual. There are also many other resources to make migrating simpler. I will add links to the best of them at the bottom of this post shortly. Twitter Chat Expert Deborah Anderson @SocialWebCafe is already hard at work migrating GrowMap, setting up FeedBlitz on our new B2C Twitter Chat Services blog and making sure our FeedBlitz setups for SMBcontest and our other JV blogs are properly optimized. Businesses and blogs MUST be building mailing lists and use social media to drive more subscribers to their lists. AND social media in one solution. If you use Feedburner now, check out the FeedBurner Migration Guide from FeedBlitz, our choice as the best premium FeedBurner Alternative. VIDEO: How to Set up FeedBlitz RSS Feeds – when you create a new feed you should see the link. Coming soon – more links to videos and other useful tips. FeedBlitz links ARE affiliate links. That is NOT why I recommend them. I use them – I want to use them exclusively. I recommend others use them at least for their RSS feeds and seriously consider using them for their email marketing and social media marketing as well. consultants, VAs, and others who manage accounts for clients. Create a new account for a client. If you click on one or more affiliate links and buy FROM THE SAME DEVICE USING THE SAME BROWSER an affiliate may receive a commission for that sale IF you do not clear cookies. an affiliate is paid than if they are not. If you have clicked on more than one affiliate link, some affiliate programs pay the commission to the LAST AFFILIATE LINK aka LAST CLICK and others pay to the FIRST AFFILIATE LINK you clicked on. This is especially thoughtful when the commissions are monthly recurring like FeedBlitz or AWeber. I encourage bloggers to use and promote FeedBlitz. If you run into difficulty, leave a comment or contact me directly for assistance. I have transferred the domain to another hosting, but Feedburner RSS on the new hosting is not running. it’s going through?